Whether you are interested in getting your Ohio Concealed Carry License, learning about home defense or simply want an orientation to the shooting sports, Sherwin Shooting Sports is here to help. Our new-shooter orientations are held every WEDNESDAY evening at 6 p.m. The class takes just about two hours to complete (including range time). Cost for the orientation is $25. Rental firearms and ammunition are extra. Each course is limited to the first 12 students. In your initial orientation, we cover fundamental safety and handgun knowledge, range regulations and sighting. Once you’re on the range, one of our range officers will visit with you to insure you’re comfortable and to answer any questions you may have. We offer an all inclusive program, instructed on site, which not only covers the basics, but also goes a step further with a focus on Ohio law from a police perspective. 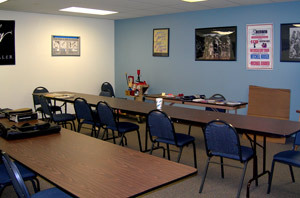 Our CCW course is taught by NRA and OPTC certified instructors. You are guided through the program in a comfortable classroom setting with a maximum of 15 students per course. You will receive all the instruction necessary to subsequently apply for your concealed carry permit. Upon completion of our 12-hour program, you will receive your NRA Basic Pistol Certificate and a Sherwin Shooting Sports CCW Certificate. In combination, these documents are proof of your education and assurance of its quality. This introduction to handguns course is designed to give you the basic knowledge, skills and attitude necessary for owning and using a handgun safely and without fear. This class is designed for people with little or no knowledge of handguns and lasts approximately two hours. Following the course, you will feel confident using the range alone and better understand what questions to ask as your skills improve. We offer private, one-on-one instruction to help you learn new skills or improve your current skills. Training is available on a host of subjects from proper use of a holster to advanced tactics. This instruction is provided on an appointment-only basis and is custom tailored to your skill level and learning objectives. The cost is $50 per hour. Email or call to schedule your continuing education today.